Finding great candidates for rolls in your company is never an easy task. In the past few years Social media recruiting has been taken up by entrepreneurs and startup companies, as job seekers begin to use social media as a major part of their job hunting process. In fact 50% of Britons turn to social networks to find work, this statistic is from a study of Social media recruiting, by Adzuna. 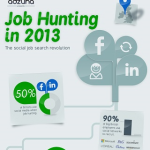 A new survey from social job search engine Adzuna.co.uk reveals that more than half of UK job seekers are now using social networks as part of the job hunting process. With 2.5 million out of work and youth unemployment at a record high, Britons are turning to social networks such as Facebook, Linkedin and Twitter to get hired with a little help from their friends. 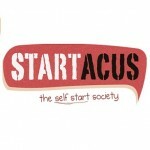 The survey, conducted in Q4 2012, shows the beginning of a ‘Social Job Search Revolution’, with over 1 million job seekers in Britain now using social networks to find work. The average British adult is connected to 300 relevant, open job vacancies through their first and second degree connections on social networks. Over 90% of large UK employers are now using social media to find staff. Big companies such as Google, Amazon & eBay have been leveraging social media to find staff for some time now, but the last 12 months has seen an explosion in the number of “non-tech” companies using social media to find staff. Companies such as AstraZeneca, Saatchi and Saatchi and hotel chain Hilton have all launched Facebook groups to increase the rate of job referrals for potential candidates. Marriott International even created a Facebook game to help fill vacancies in 2011. While Linkedin is generally seen as “the” place to go for professional networking, job seekers in the UK would rather leverage their Facebook (43%) than Linkedin (22%) networks to find their dream job. Men and women are equally likely to leverage their professional and personal social networks to start a new career, with 55% of women turning to Facebook and 58% of men preferring to use LinkedIn. 32% of Southerners favour Linkedin for job advice and help, whereas Northerners using social networks tend to start their job search on Facebook. 58% of active social job seekers in Scotland use Facebook as their first port of call in the job hunting process compared to only 34% of Londoners.- Retail, Design & IT professionals top the charts for the most social jobseekers. 33% of people surveyed in these industries claimed to have used social networks to land their dream job. Domestic, Maintenance and Legal job sectors are the least social jobseekers with less than 5% of people working in these industries choosing to use sites like Facebook or Linkedin to find work. This study compiled by Adzuna is not the first time they have crunched data for a public viewing. Adzuna’s data also powers the Number 10 Dashboard, used by the Prime Minister and senior officials to keep track of economic growth on a daily basis. To find out more about Adzuna’s, and it’s founders, please read the founders interview with The Startup Magazine. If you would like to find out more about how to find your perfect candidate for free, see our article on how to beat the recruiter.